Using calendars to manage time and resources is a common requirement in many systems and for many reasons. 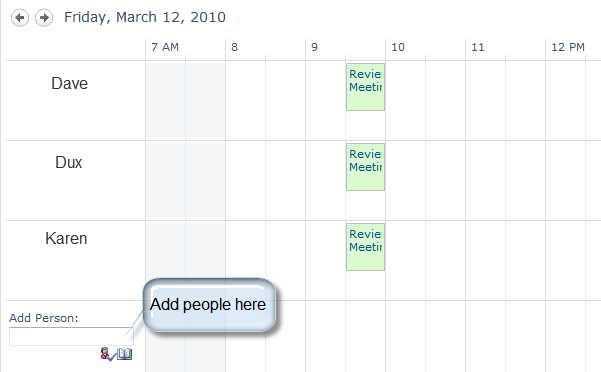 Being able to quickly and easily create calendars and views of events has always been a powerful tool within SharePoint. Often however the out of the calendar features were not sufficient to meet users needs and third party equivalents needed to be considered. SharePoint 2010 has enhanced calendar facilities that offer some extra features to help with this. 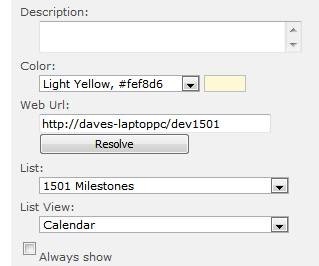 To see this, create a calendar by using the ‘Site Settings’ then within ‘More options’ select the ‘Calendar’ image. This will take you through the dialogs needed to create a new calendar type list as per SharePoint 2007. In order to get the new features we need to activate a feature at the site level. To see this use the, ‘Site Actions | Site Settings | Manage Site Features’, links. This is a nice step on from the 2007 calendar allowing us to manage people. SharePoint server adds the ability to manage resources such as rooms and equipment as well. If you need to use multiple calendars to track events, then this next feature will really help. This is that of ‘Calendar overlays’ whereby we can view multiple calendars at once in a single view – as if the calendar contents had been laid on top of each other. When pressed displays the following where you select the calendar to be overlaid. The calendar can either be a SharePoint calendar or an Exchange calendar! – Another significant enhancement. And at this point of the development of our new SharePoint 2010 course, time is speeding up as we get closer to our alpha date. Our First Run Pilot session on April 13-16 in Washington will then be next. If you would be interested in attending, let us know! No matter how good the calendars are, they mean nothing unless we actually use them and carry out the work. My calendar entries for this week are beginning to fill up with items of course material to review ! To learn more about SharePoint, download Learning Tree’s free white paper, SharePoint® Empowerment: Making Document Management and Organizational Collaboration Easier. Learning Tree offers over 210 IT training and Management courses, including SharePoint training. Check Out Federal News Radio’s “Ask the CIO” Segment Sponsored by Learning Tree! Get 50% OFF Select Learning Tree Courses by Joining the New My Learning Tree Community! Do you need a customized SharePoint training solution delivered at your facility?